This week my school is having its annual Bible Conference. The theme for this year is revival. As part of the program, various faculty members and students are presenting brief accounts of American revivals. What follows is my presentation Wednesday morning on the Great Awakening. It’s 50 years before the American Revolution. What will one day be the United States of America is a collection of 13 British colonies huddled against the Eastern Seaboard. Its people have come here for many reasons. Some have come seeking an economic chance by dint of hard work in land that no one has ever plowed; some have come to escape dark stories in the Old Country. Some have been here for a hundred years; their grandfathers and great-grandfathers came seeking religious freedom, the liberty to worship God after the dictates of their own consciences. But that path is never easy, and it’s never certain. Eight of the colonies now have established churches, with the financial support and legal backing of the colonial governments. 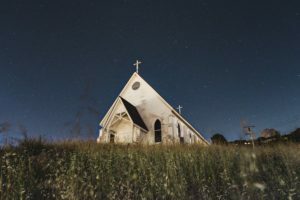 What happens when the church is the same as the governmental power? It’s usually not a pretty picture. Church leaders get comfortable and complacent and sometimes abusive. External conformity and empty formalism become the tradition, and people think that God is on their side because they drop by his house every week and say the right words, even though they don’t think much about what they’re actually saying. So lots of people are claiming the name of Christ without living like it. Worldliness is common. Rationalism, the rejection of the supernatural, is making inroads. There is no passion. In 1739 arriv’d among us from England the Rev. Mr. Whitefield, who had made himself remarkable there as an itinerant Preacher. … The Multitudes of all … Denominations that attended his Sermons were enormous and it was [a] matter of Speculation to me who was one of the Number, to observe the extraordinary Influence of his Oratory on his Hearers, and how much they admir’d and respected him, notwithstanding his common Abuse of them, by assuring them they were naturally half Beasts and half Devils. It was wonderful to see the Change soon made in the Manners of our Inhabitants; from being thoughtless or indifferent about Religion, it seem’d as if all the World were growing Religious; so that one could not walk thro’ the Town in an Evening without Hearing Psalms sung in different Families of every Street. With Whitefield the flame moves northward. Jonathan Edwards, a pastor in Northampton, Massachusetts, preaches his famous sermon “Sinners in the Hands of an Angry God” (1741), and the people respond with cries for mercy. In the month of May 1741, a sermon was preached to a company at a private house. Near the conclusion of the exercise, one or two persons that were professors were so greatly affected with a sense of the greatness and glory of divine things, and the infinite importance of the things of eternity, that they were not able to conceal it; the affection of their minds overcoming their strength, and having a very visible effect on their bodies. When the exercise was over, the young people that were present removed into the other room for religious conference; and particularly that they might have opportunity to inquire of those that were thus affected what apprehensions they had, and what things they were that thus deeply impressed their minds. And there soon appeared a very great effect of their conversation; the affection was quickly propagated through the room; many of the young people and children that were professors appeared to be overcome with a sense of the greatness and glory of divine things, and with admiration, love, joy and praise, and compassion to others that looked upon themselves as in a state of nature. And many others at the same time were overcome with distress about their sinful and miserable state and condition; so that the whole room was full of nothing but outcries, faintings, and suchlike. The movement subsides in New England about 1760, just as inexplicably as it had begun. And so it ever is. Unbelieving churches shrivel and die, even as the old “mainline churches” are dying today. But God’s Spirit moves among his people, and the story goes out; and God brings to himself uncounted sinners who find rescue and grace and mercy and peace—and who rejoice in that rescue in ways that shake the world. Excellent short historical snapshot of one of the great movements of the Spirit to regenerate the people’s of the North American continent. Thank you for sharing!